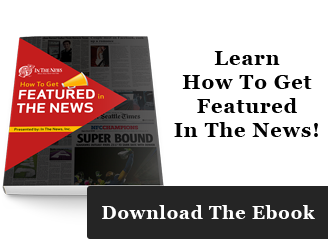 Creating a custom framed magazine or newspaper article could be done on your own, but you would have to deal with the trouble of clipping an article and bringing it to a frame shop, or even mailing it to a framing service. With In The News, you can skip all the hassle. Simply select an article and a style for your plaque, and In The News handles everything else. 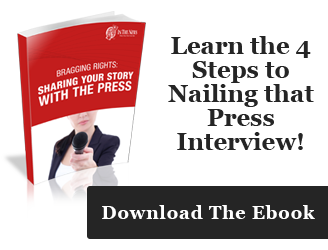 There is no need to send in your original copy of the article, because In The News has subscriptions to all of the magazines and newspapers across the country and in most cases will have a copy of the article you want on file. We will clip the article to your specifications and laminate it to ensure it will stand up to the test of time without deterioration or damage. In The News has a host of graphic designers and artists who will make sure your plaque is tastefully designed. Once you decide on a layout for your article, our team of designers will examine your layout and adjust it to maximize visual appeal. You can choose from a variety of high quality 3/4 inch birch wood finishes for your mounted article and even include a customized engraving. These engravings are an elegant way to mark the plaque with relevant details like the publication date, article title, and name of the recipient or recipient's company. Custom text engravings are available in gold or silver lettering with black overlay and come free with the purchase of any framed magazine or newspaper article. For an extra fee, company logos can also be engraved. Our specially designed, non-glare lamination technique ensures that your framed article will be easily readable from any angle and in any kind of lighting. 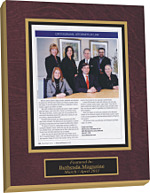 All our plaques are 100 percent guaranteed to satisfy. We realize that it can be difficult to get a good feel for the look of a product just from online previews, so we offer a ten day trial inspection period to all our customers. 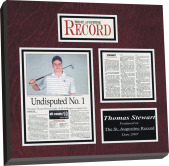 If you are not completely satisfied with any aspect of your custom framed article (or if the plaque has been damaged in the mail), we will pick up the product and make things right. You do not authorize payment until you have received your finished piece and had the opportunity to inspect it, so there is no need to worry about losing money on a plaque that ends up being useless. 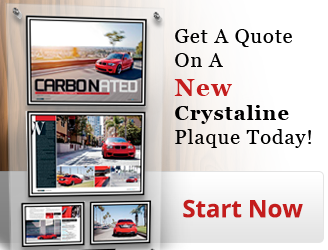 You can easily get started creating your custom plaque today using our streamlined online ordering system. In The News is the best place to go for one of a kind custom framed articles, as well as high quality laminating and framing of awards, certificates and photos. We have over 25 years of experience laminating, framing, mounting, and engraving, and we are proud of our products. Give our service a try, and we're sure you'll be happy with the results. If you're interested in ordering multiple plaques, perhaps for different members of your office or for different locations, contact us. Quantity discounts may be available.